Though it was produced by Casa 7 Leguas, one of Mexico’s oldest distilleries for years, Tequila Patrón wasn’t always the high quality product we know today. In fact, for many years, it was more along the lines of bottom-shelf store brand tequila, that was consumed for intoxication, as opposed to flavor. That all changed in 2000. In 1989, St. Maarten Spirits, owned by John Paul DeJoria and Martin Crowley, purchased the rights to the brand. In 2000, St. Maarten Spirits, hired Ed Brown as CEO. Brown realized that making the brand into a premium brand would increase sales. In 2002, the company moved production to a brand new facility. Inspired by Gray Goose ads, Tequila Patrón advertising began to promote the product as “premium” and it boasted “taste and sophistication.” Eventually, with a little help from Lil Jon, and other hip hop, and country singers, Tequila Patrón has not only become a fixture in the trendiest nightclubs and restaurants, but also a part of pop culture. One other way Patrón Tequila boosts their product is through auto racing sponsorship. Tequila Patrón could be considered more devoted than most companies to auto racing. CEO Ed Brown is also a driver for Extreme Speed Motorsports, an FIA World Endurance Championship team, which races in the Weathertech SportsCar Championship. Brown and his team have won the 2014 Continental Tire Monterey Grand Prix, the 2016 Rolex 24 at Daytona, and the 2016 Mobil 1 Twelve Hours of Sebring. 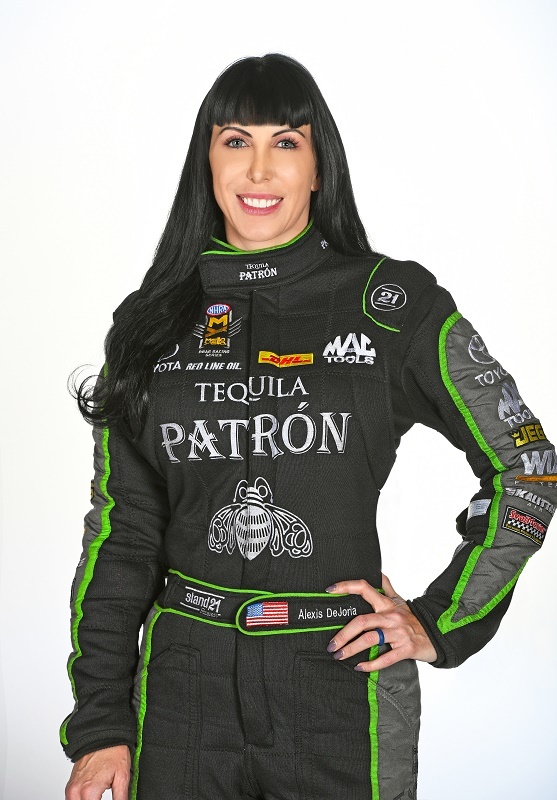 Tequila Patrón’s other major racing sponsorship comes in the form of John Paul DeJoria’s daughter Alexis. Alexis DeJoria got her start in 2005 in the NHRA Sportsman division, first racing in Super Gas before moving to Super Comp, and winning the Sportsman Nationals. In 2006, she stared racing in Top Alcohol Funny Car, and by 2009, she had founded her own team, sponsored by Tequila Patrón. 2011 was a big year for Alexis. She scored her first win in Top Alcohol Funny Car at the 2011 NHRA Northwest Nationals, becoming the second woman to do so. 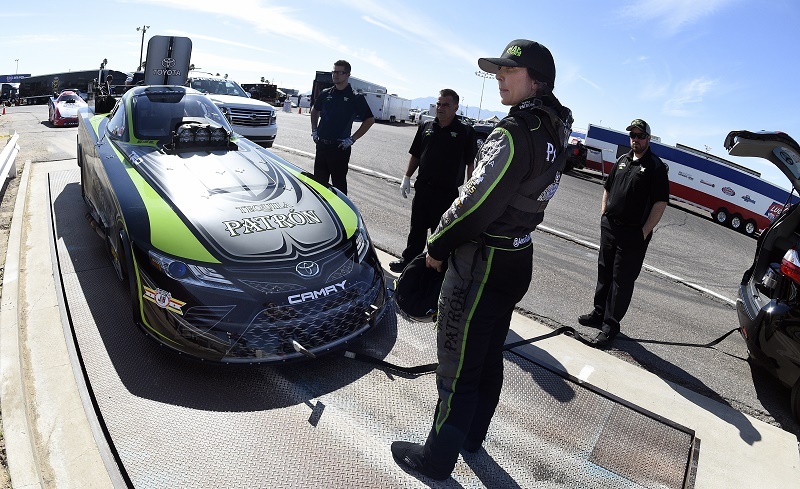 She also got her nitro licensee, and joined Kalitta Motosports, driving the Tequila Patrón Toyota Funny Car. She had moderate success in 2012, and 2013. 2014 was her breakout year, winning the first race at Phoenix, the first race at Las Vegas, and the coveted US Nationals at Indianapolis. She also became the first woman to race a sub 4-second run, with a 3.998 run at Ponoma. In 2015, Alexis didn’t have the same success as the previous year, making it to only one final round, losing to defending Funny Car champion Matt Hagan. She did make the Countdown to the Championship, finishing 8th in the standings. 2016 was looking to be a good year. She won the first Las Vegas race, and set personal ET and speed records at Topeka, where she ran a 3.875ET 332.18 MPH in Q2. Sadly, a broken pelvis at Toyota Sonoma Nationals, at Sonoma, and a concussion at the Toyota Nationals at Las Vegas stalled what could have been a championship season. 2017 has been a mixed bag for Alexis. She has had some good runs, and put up some good numbers. Though a family issue has forced her to miss a few events, she isn’t out of the championship picture yet. If Robert Hight can win the Funny Car championship from the 10th seed, Alexis can surely win too. Dave-What is your uniform setup for a race weekend, that is, how do you rotate suits, helmets, shoes, gloves, etc over a race weekend? Alexis-I have two firesuits, two helmets, two sets of gloves, two pairs of shoes, two pairs of fire boots, and multiple pairs of carbonex underwear and tops. Throughout the race season, I go back and forth between the two suits. They get pretty dirty so I try not to wear one over and over again. I rotate between the two of them and at the end of the year, I sign them and auction them off for charity. Dave-How long do driver gloves, shoes, and balaclavas tend to last? Alexis-I’ve had my balaclavas and some of my carbonex underwear, tops and socks for a few years. I take really good care of my things. They do get pretty thrashed, but I take them home and wash them after every race and hang them to dry. Shoes, it just depends. I wear them until they have holes in them basically; until they’re no longer safe. Same goes for my gloves. Dave-Some drivers black out parts of their helmet visor to cut down on distraction, which Jack Beckman referred to as “the Clydesdale effect.” I have noticed that you prefer to have your whole visor clear, have you tried the Clydesdale effect? Alexis-I have not tried ‘the Clydesdale effect.’ For me personally, I like to be able to focus on the top end of the race track where I want to end up, but also still be able to see in my peripheral vision. For me it helps, especially on race day; I like to see and be prepared for whatever may happen. Alexis-No modifications to my uniform were made. There were some modifications done to the cockpit of the race car to make it safer in the event of something like that happening again. But no, as far as what I wear personally, there were no modifications. Alexis DeJoria has experienced a lot of ups and downs in her racing career. Her driving talent and her tenacity have helped her reach the Mello Yello Drag Racing Series. She is a popular driver, and having met her in person at Route 66, I can honestly say she is an amazing person. I would like to thank her, and Allison McCormick for helping make this happen!